MIAMI — Chris Bosh stood at centre court, looked out at the Miami Heat fans and just let the words flow. He spoke about his health scare in 2015. He spoke of his grandfather, the one he called Daddy Jack, the one who told his first grandson that he was going to be special one day. 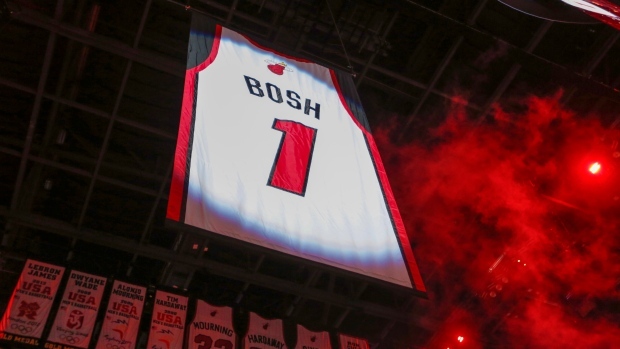 Wearing a Heat championship ring on both hands, Bosh watched a giant banner bearing his name and No. 1 raised to the rafters of AmericanAirlines Arena on Tuesday night — then delivered an emotional address to the crowd, part of it even in Spanish as a show of respect to the Latin culture of Miami. Riley called Bosh's rebound and assist late in regulation of Game 6 of the 2013 NBA Finals — the ones that set up Ray Allen's game-tying, series-saving 3-pointer — the biggest in Heat history. Bosh went a step further. There will be, at minimum, three more Heat jersey retirements in the not-so-distant future — Dwyane Wade, LeBron James and Udonis Haslem are all locks to see their name and number swaying over the court not long after their careers end. Wade and Haslem were on the court for the celebration. Heat coach Erik Spoelstra decided long ago that, even with Tuesday's Miami-Orlando matchup being such a big game in terms of playoff hopes, his players were going to be out on the floor to see the Bosh ceremony. Spoelstra tells stories of his time with Bosh all the time. One of his favourites — the night Bosh, after a playoff loss in Indiana put the Heat down 2-1 in a series, knocked on the door of his hotel suite at 2 a.m. with beers in hand. They sipped and talked for 45 minutes, not a word said about basketball. The Heat won Game 4, and the series.